I just wanted to take a moment to recognize a truly remarkable feat that took place this two weeks ago in the Capital District MSBL (Albany, NY). The Indians in the 33+ Division won their 50th straight regular season match on Tuesday, May 9th – a stretch that goes all the way back to July of the 2014 season. Winning 50 straight games in any sport is a difficult task; and arguably even more difficult in the sport of baseball. A team can suffer a rash of injuries, a pitcher with a bad day, run into a team with a dominant pitcher for even one night, or a litany of other potential obstacles to overcome. In fact, the streak ended at 50 games because the 33+ Mets had one of those nights where they were just the better team that night; further indication of how impressive the 50-game winning streak truly is. Our Black Bears suffered in seven of those 50 defeats. I wish to congratulate Indians manager Jim Bonaparte and the entire Indians roster (including any players who may not still be playing on the Indians but helped achieve this amazing milestone) for setting a high-water mark for all the other teams in the CDMSBL to t ry and surpass. I’m not sure we’ll see it in our lifetime because the Indians are a collection of really talented baseball players and play the game with the passion and drive that earns a team a 50-game winning streak. 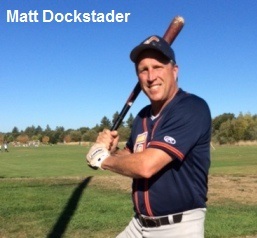 Matt Dockstader went 6 for 6 with a triple for the Jazz of the Redwood Empire (CA) Baseball League’s Legends division. They defeated the Blues and now stand at a perfect 4-0. Jazz catcher and clean-up hitter Mark Yanuskiewicz also was perfect at 5 for 5 with a walk. These three and four hitters in the lineup posted an 11 for 11, ten runs scored and six RBI. WOW! Here are the weekly happenings in the St. Clair Shores League in Michigan. Just click on their logo. Thanks for sending it along, Matt!